Browse all of eCity's marketing resources library or use the filter and search options above to find exactly what you're looking for. Discover a highly efficient process for solving the biggest creative problems. Build, test, and win in just 5 days. 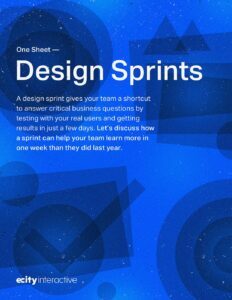 Get the design sprint one sheet. 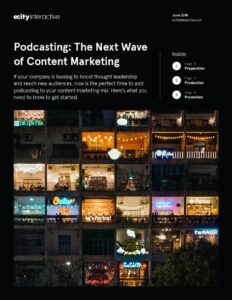 Learn how Dell, SAP, and Salesforce are generating brand awareness, establishing thought leadership, and engaging niche audiences through the power of podcasting. Get the eBook. 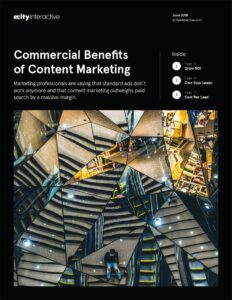 Marketing professionals are saying that standard ads don’t work anymore and that content marketing outweighs paid search by a massive margin. So, we wanted to investigate the top three marketing benchmarks that support this statement and why. Download the eBook to learn more. 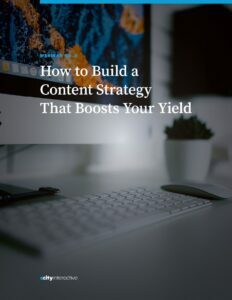 If your company is looking to build valuable and relevant content that attracts more of the right people and grows brand awareness, then now is the perfect time to revisit your digital content strategy. Here’s what you need to know to get started. 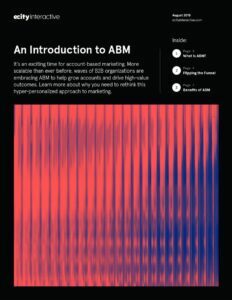 It’s an exciting time for account-based marketing. Learn more about why you need to rethink this hyper-personalized approach to marketing. 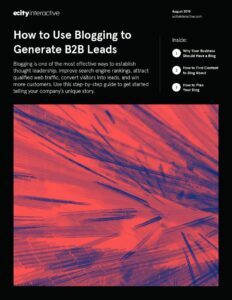 Blogging is one of the most effective ways to win more customers. Use this step-by-step guide to get started telling your company’s unique story. Is your website underperforming? 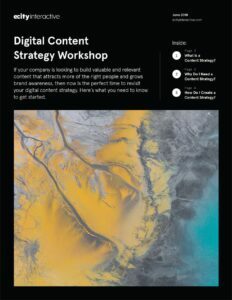 Learn how our team can guide you through creating the most important elements of an effective content strategy in our day-long workshop. 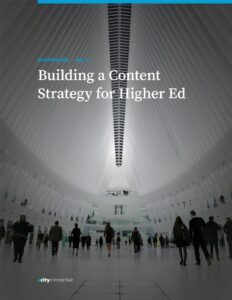 Learn how your institution can implement a digital content strategy that will spark a connection with users and inspire action from prospective students, alumni, and donors. 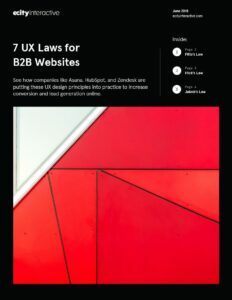 Increase your website’s conversion rate with these UX laws, and see how companies like Asana, HubSpot, and Zendesk are using UX design to increase conversion and lead generation online. 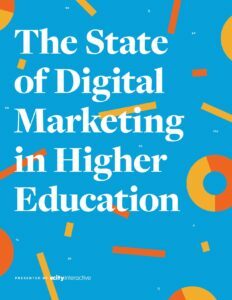 Download our State of Digital Marketing in Higher Education report and discover how higher ed marketers are approaching blogging, social media, email marketing, and more. 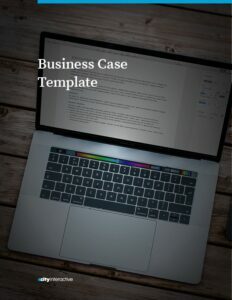 Learn how to write a convincing business case that demonstrates the value of your project to decision-makers. 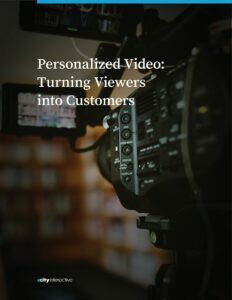 Discover a new way to engage, convert, and delight video audiences by connecting with each viewer on an individual level. 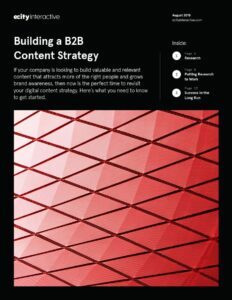 Do you know how your competitors are using content to generate business online? 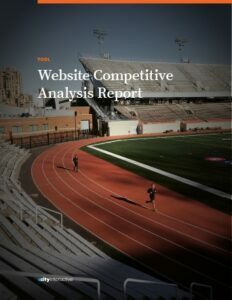 Request a report to understand how customers are finding competitor websites and identify areas for improvement. This webinar provides actionable steps you can take to develop a content strategy that will attract and retain right-fit students and their families. 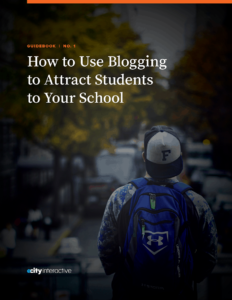 Download our guide and learn how to create and curate blog content for your school, create blog ideas, optimize blog posts to get found by prospective students and how to convert blog traffic into applications. 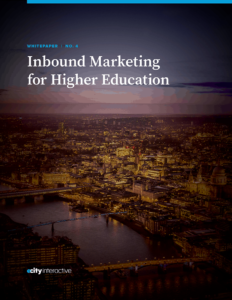 Learn how Inbound marketing can empower Higher Ed marketers to attract the right people, convert prospective students, close applicants and delight alumni. 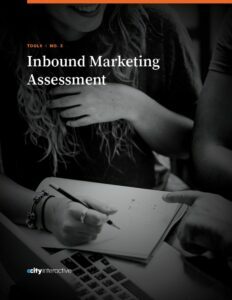 Discover how you can get more traffic and more leads from your website through this free inbound assessment by one of eCity’s inbound marketing specialists. No risk. No obligation. 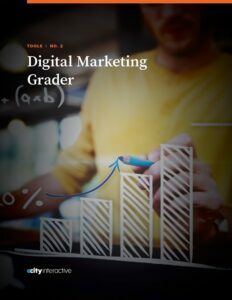 Use our Digital Marketing Grader to determine what aspects of your online marketing efforts you’re succeeding at and what you should spend time improving. 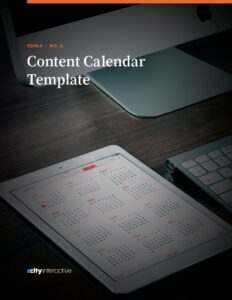 Our free, customizable content calendar template makes it easy to organize your blogging efforts by tracking publishing dates, keywords, associated calls-to-action, and more. 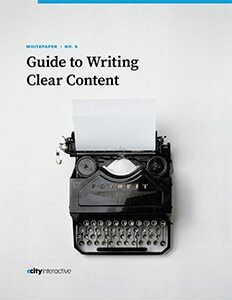 Download our white paper and learn how to craft cleaner, clearer content that will resonate with your audience and rank well with search engines. 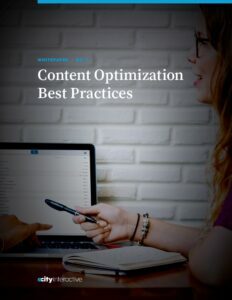 Discover how optimizing these seven website elements can have a significant impact on the number of people who find your website and learn about your products and services. 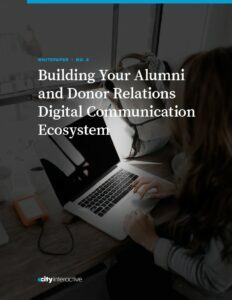 Download our white paper and find out how your development departments can achieve better results with young alumni through digital outreach and engagement. Save time and increase engagement by implementing a centralized CMS content hub that allows you to organize content for various audiences all in one place. Our website RFP template will help you communicate and prioritize your website goals, attract an agency that is a good fit for your business and create a better end result. Prioritize your efforts and start make better decisions by implementing user personas in your organization. 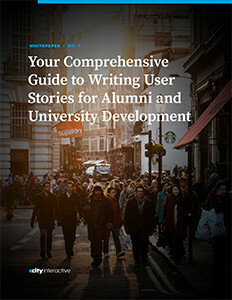 Learn how to write effective user stories that will help create a digital experience tailored specifically to the needs of your alumni, donors, volunteers, and staff. 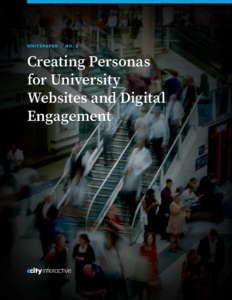 Our free, customizable persona template will let you easily organize your research to create your very own personas. 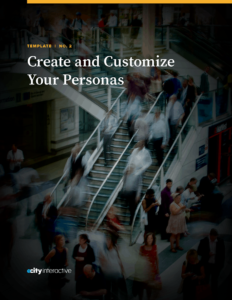 With this template you can create well-formatted personas that you can share with your entire company. 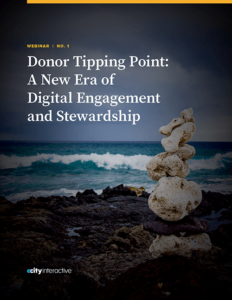 This webinar reviews how organizations increase their credibility and conversion rates with potential donors by looking at global giving trends, content personalization, and new technology that show gifts’ impact. 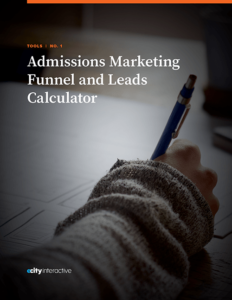 Use our interactive calculator to set achievable goals and prioritize your marketing efforts at every stage in the admissions funnel. Not every website project requires clients to fill out a request for proposal document. Sometimes, you just want to answer a few questions and talk directly to an agency. 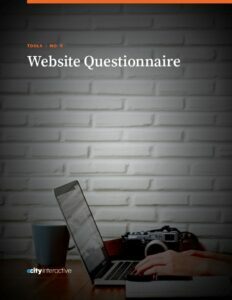 With our website questionnaire, you can address the aspects that matter most about your website project and start a conversation in a more efficient manner.